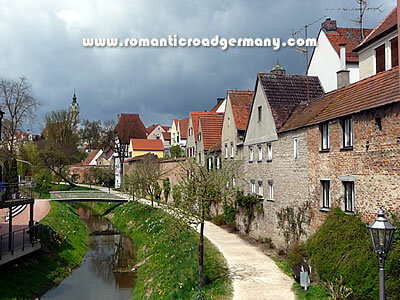 Donauwörth is a historic town on the strategically-important junction of the Danube and Wörnitz rivers. To the north on the Romantic Road is the small town - and large castle - of Harburg, while Donauwörth is the last real stop heading south before reaching the city of Augsburg. As might be expected from a history rich in religious conflicts and with its status as a "free Imperial city", there is plenty to see in the town. Legend has it that Donauwörth was originally founded by two fishermen on the Ried island (which is just to the south of the historic centre in the River Wörnitz). As important probably was the fact that the island narrowed the Wörnitz into two channels that could be more easily bridged and in early days fords or bridges were strategically important locations where settlements could grow. These days the island itself is a pleasant area outside the main town centre which houses cafés and the local museum, which concentrates on the history of the inahbitants in the 1800s. The centre of Donauwörth is reached through one of what was originally four massive town entrances - the Rieder Tor. (This particular tower and gateway has been restored after damage over the centuries.) Another remaining smaller tower can just about be seen in the picture at the top of the page, which shows the present channel and the exterior of what remains of the town wall. Donauwörth was granted town rights as early as the 12th century and was a free Imperial city for some of its history. It was fortified for a reason - as the location of one of the important crossings of the Danube - and was heavily involved in the religious wars of the Reformation and Counter-Reformation, as well as the campaigns of the War of the Spanish Succession. The defeat of the Bavarian forces at a battle near Donauwörth led to the city losing its privileges as an independent town. The town centre is filled with historic buildings - although many have had to be renovated or restored. At the top of the hill is the Monastery of the Holy Cross, built in the 11th century to house an alleged piece of the original cross acquired during the Crusades. 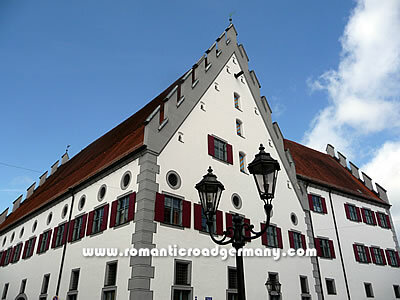 The image at the top of this section is of the Fuggerhaus, which now houses the regional government and is considered a prime example of Renaissance architecture from the 16th century. Slightly down the hill on the other side is the Gothic parish church - the Minster of Our Lady - from the 15th century. 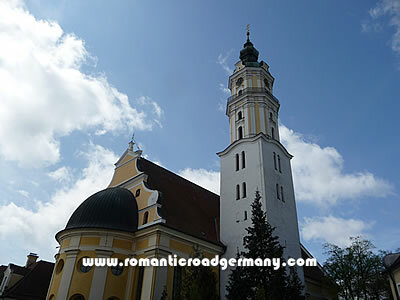 It is possible to climb the church tower in the summer months for a good view of Donauwörth and the surrounding countryside. The main street down the hill is Reichsstrasse (Empire Street) - named because it was considered part of the Imperial route between the important cities of Nuremberg and Augsburg. Markets were held along this street and some of the oldest buildings in the town still line it. At the bottom of the hill is the tourist information office in the historic town hall, the gateway to the Ried island and the former seat of one of the oldest sections of the Order of Teutonic Knights. As well as the cultural museum on the island, Donauwörth has a town museum in the Rieder Tor, an archaelogical musum in Reichsstrasse, and a doll museum, which features the work of Käthe Kruse - an actress and dollmaker whose dolls were tremendously popular in Germany in the early 20th century and are now collectors' items (they are still produced in Donauwörth).